Tune in to PBS on Thursday, January 21, 2010 at 8:00p.m. * for Live From Lincoln Center's telecast of violin favorite Joshua Bell with special musical guests from Lincoln Center's intimate Stanley H. Kaplan Penthouse. Included on the program will be performances of Come Again with music icon Sting, My Funny Valentine with Emmy and Tony Award-winner Kristin Chenoweth, I Loves You Porgy with jazz trumpeter Chris Botti, O, Cease Thy Singing, Maiden Fair with acclaimed baritone Nathan Gunn, I'll Take Manhattan with the incomparable composer/pops conductor Marvin Hamlisch, Eleanor Rigby with rock musician Frankie Moreno, Left Hand Song with singer/songwriter Regina Spektor, and Para Tí by Grammy-nominated Cuban music sensation Tiempo Libre. Also performing is Bell's frequent collaborator, pianist Jeremy Denk. 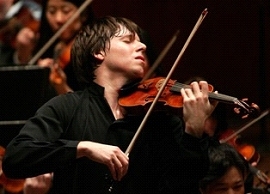 In a Live From Lincoln Center first, Joshua Bell will perform a duet performance of Grieg's Violin Sonata No. 3, Movement II featuring Sergei Rachmaninoff with a Zenph piano, a technological innovation that captures the nuances of Rachmaninoff's keystrokes and pedaling and enables a specially retrofitted Steinway to replay Rachmaninoff's performance...by itself! As the first American-born violinist to star in the Live From Lincoln Center series at the Kaplan Penthouse, Bell has for over two decades, enchanted audiences worldwide with his breathtaking playing and tone of rare beauty. A recipient of the coveted Avery Fisher Prize, and just named by Musical America as the 2010 Instrumentalist of the Year, Bell is equally at home as a soloist, chamber musician, and orchestra leader. His restless curiosity and multifaceted musical interests have taken him in exciting new directions and have earned him the rare title of "classical music superstar." With projects resulting in Grammys, an Oscar and a Pulitzer Prize, Bell is best known for performing the Oscar-winning soundtrack of John Corigliano's The Red Violin. His two recent Sony Classical releases -- At Home With Friends, which inspired this TV special, and Vivaldi: The Four Seasons debuted at #1 on the Billboard Classical Music Chart. Bell last starred on Live From Lincoln Center as part of the Mostly Mozart Festival in August. He has recorded more than 35 albums and made acclaimed Sony Classical recordings of the concertos of Beethoven and Mendelssohn (both featuring his own cadenzas), Sibelius and Goldmark, and the Grammy Award-winning Nicholas Maw concerto. He is featured on the recently released soundtracks of Angels & Demons and Defiance. Bell plays the 1713 Gibson ex-Huberman Stradivarius. Live From Lincoln Center is in its 34th broadcast season. The series has received 13 Emmy Awards, most recently for the broadcast of New York City Opera's production of Madama Butterfly. Produced by Lincoln Center's John Goberman, this series has made the world's greatest artists on Lincoln Center's renowned stages accessible to home viewers in virtually every corner of the United States. It is the only series of live performing arts telecasts on American television today. Live From Lincoln Center is made possible by a major grant from MetLife.